AMMONNEWS - The Syrian army and a rebel group in the southern province of Deraa have accused each other of breaching a ceasefire deal agreed two days ago. Opposition activists said on Sunday that Syrian government air raids targeted a group of rebel fighters in Um al-Mayadin village, just 5km north of the Jordanian border, killing at least four people. The ceasefire deal - brokered by Russia, a Syrian government ally, on Friday - saw rebels agree to hand over heavy weapons in exchange for security guarantees and safe passage to other areas. Rebels in Um al-Mayadin refused to give up their arms, a source in Deraa province told Al Jazeera. They accused Moscow of not abiding by the agreement. It was not clear which part of the deal they referred to. Under the agreement, Russian military police were to be deployed in the Deraa areas previously held by rebels. It was also agreed that Syrian government forces were to withdraw from four villages in eastern Deraa: Kahil, al-Sahwa, al-Jiza and al-Misaifra. As of Sunday, the Syrian forces had not pulled out of the villages. 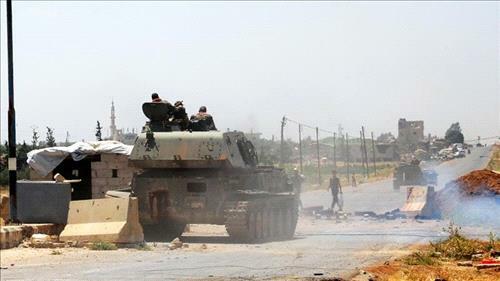 Meanwhile, in the western suburbs of Deraa province, clashes between the Syrian army and rebels opposed to the truce deal intensified on Sunday, according to the source inside Syria. Rebels in Deraa's western areas have formed what they call "the Southern Army", a group of 11 rebel factions, according to a statement they issued on social media on Sunday. "We call on all factions in the south to join our army in defending our land and dignity," it said in a statement. According to the United Nations, the Syrian government's southern offensive uprooted more than 320,000 people over the past two weeks, including about 60,000 who sought shelter to areas near the border with Jordan. Less than 48 hours since the truce deal was reached, almost all displaced Syrians at the Nassib-Jaber crossing had left the Jordanian border and returned to areas in southern Syria, according to Anders Pedersen, the UN resident and humanitarian coordinator in Jordan. "We have a very low number of people that are still there [near the Jaber-Nasib crossing]. They are only about 150-200 people at the border in the free-trade zone," Pedersen told reporters in Jordan's capital, Amman, on Sunday. "As far as we understand, they are almost exclusively men," he said. Still, there is little information about the tens of thousands of others who headed to the frontier with the Israeli-occupied Golan Heights in search of safety. "While we know that most families along Jordan's northern borders have returned home, we do not have information about the tens of thousands of families who were based along the Golan Heights," Rula Amin, Middle East and North Africa spokeswoman for the the UN's refugee agency, told Al Jazeera on Sunday. UN officials say aid delivery in southwest Syria has been impeded since June 27 due to the security vacuum in the area. "We keep repeating our appeal to the partners of the conflict on the ground - please allow us access," said Pedersen. "As the UN in Jordan, we have been on standby, ready to go as soon as the necessary approvals are in place to do so."